Have you ever noticed the difference in day-time advertising, as opposed to the advertising you see at night? Some commercials last longer at 1:00 PM than they do at 5:00 PM… and there are many variations depending on the channel. Well, there is actually a reason for that and it’s not as far-fetched as one might believe. This is part of behavioral selling, where the way you deliver your message can make the difference between attracting a new client or losing them before you even opened your mouth. This same model can be successfully applied to boost your own bottom line. There are people in charge of content development, while there are others are in charge of decision-making. Research suggests identifying the demographics, psychographics and brand loyalty of each viewing audience before crating that content for airing around the globe. Because of this, we see content change based on the season, sporting event or even television programming that we are tuned into. Diehard fans of The Walking Dead might find advertising bombarding them with zombies or thoughts of the afterlife, while advertising for This is Us reflects everyday life, often depicting family, experiences and adventures that promise memories to last us a lifetime. Who do you sell to? Getting to know your audience will provide great insight into the minds of your customers. But, remember, not everyone or every experience is the same. Through demographics, we can learn about the interests of our audiences as a whole, but we are only chiseling away at the exterior and still not targeting the customer directly. There is a reason Days of Our Lives, in all 52 of its glorious seasons, only has 2.25M daily viewers consisting of a majority female demographic from Suburbia ranging in age 18-49, while This is Us (also on NBC) brings home more than 8.1M a week from a quite similar 18-49 demographic – this time in demand by both male and female audiences, everywhere. Both showcase relationships between lovers, married couples, families and friends. Both display scandal, love and companionship. Yet, only one reigns supreme, and the fact that This is Us airs during primetime is of less of importance than it once used to be, thanks to on-demand programming and continued support from viewers like you. Let’s take this same concept to the corporate arena. We have a product and/or service that we are looking to advertise. What does your content say about your product? How can you better connect with your audiences? Do we actually have a product that our audience is interested in? These are questions one should ask when running an assessment on their current business strategy. Starting with demographics is a very helpful approach to narrowing down targets and buyer personas. But, let’s not forget, we also have DISC and a means to find our niche amongst a set demographic. We just need to apply this logic and arrive at our destination, further providing them with a message that resonates with their core being. Once we learn the personality types that make up our niche audience, we can then customize the message to target each group of people directly. Do you remember the saying, “Everyone is different, but everyone is predictably different?” Implementing DISC into our sales strategy will turn us into a pro-seller and help us appeal to our customers’ every desire. 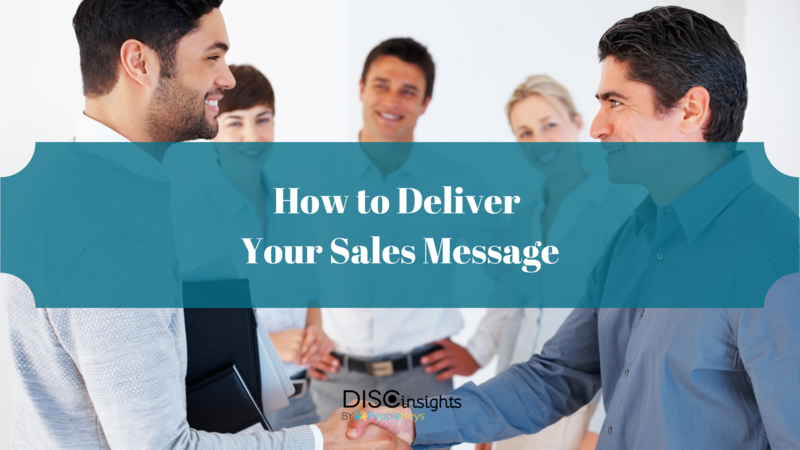 Customizing your message is like hitting the target where it matters the most. Understanding your customers is like holding the “CliffsNotes” to life. You can work smarter and cater your approach, thus providing your customers with exactly what they need. If our audience is driven by data, then we provide them with data. If our audience seeks an experience, we find ways to let them experience the product before they buy. If our audience seeks validation and trust only from the experience of others, we provide them with feedback. But if our customer seeks something more, then we open the doors of possibility and evolve our product to meet those needs directly. You should define the need, interest and/or problem and develop a solution to that problem. We must then find a way to communicate how our product meets their needs and how they will benefit from becoming a customer over time. Want to find out more about becoming a pro-seller and utilize behavioral approaches to increase your performance? Click here, and let us introduce you to something unique!